That is why we teach music! For ages birth through 3, we recommend Prelude Suzuki Early Childhood Education. Students begin their education with individual and group lessons. As students develop musically, Boulder Suzuki Strings offers them a diverse array of opportunities to explore and grow as musicians, including a beginning orchestra, fiddling classes, chamber music groups, advanced repertoire classes and a touring ensemble. Through group and solo recitals and workshops, students develop as musicians and performers within a supportive learning environment and community. 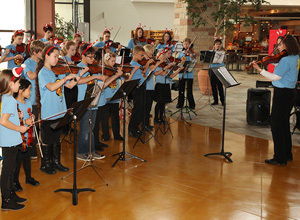 Boulder Suzuki Strings welcomes all students and families and does not discriminate on the basis of disability, race, religion, gender, sexual orientation, age or marital status. Give your child a lifetime gift of immeasurable value – the development of musical ability. Amy Gesmer-Packman founded Boulder Suzuki Strings in 1982 as a university program when she began graduate study with renowned Suzuki pedagogue William Starr at the University of Colorado, Boulder. By the time Amy earned her master’s degree in violin performance and pedagogy, Boulder Suzuki Strings had grown to more than 70 students, and was independent of the university. Boulder Suzuki Strings incorporated in 1994, and was awarded 501 (c) 3 status in 1996. Today, Boulder Suzuki Strings has more than 200 students and 14 teachers, making it the largest Suzuki program in the front range. The program continues its connection with CU Boulder; Music students regularly observe Boulder Suzuki Strings lessons, and faculty members are often guest clinicians at the program’s annual Winter Workshop. Boulder Suzuki Strings graduates have gone on to study at esteemed music schools including Juilliard, Oberlin, Cincinnati CCM, Vanderbilt, and CU Boulder.